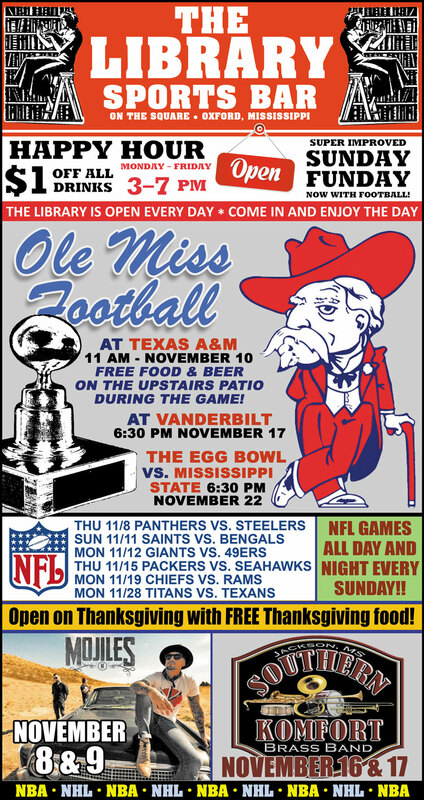 Library: Open – FREE Thanksgiving meal and FOOTBALL ALL DAY; Egg Bowl at 6:30 pm! Moe’s BBQ: Bingo Night – Moe’s is open on Thanksgiving! These restaurants are CLOSED today: Ajax Diner, B’s Bar-B-Q, Fergndan’s Wood Fired Pizza, Greenline, Grit, South Depot, Snackbar, Gus’s World Famous Fried Chicken, Thacker 564, Track 61, and Volta Taverna. Bacchus on the Square is open! Bacchus is serving a special Thanksgiving Buffet! Big Bad Breakfast is open! Bouré is open on Thanksgiving! Chancellor’s House is open on Thanksgiving! The Chancellor’s House is serving a special Thanksgiving Buffet! City Grocery is open on Thanksgiving! City Grocery is booked solid for lunch, but still has openings for dinner. Please call for seating. The Coop (at Graduate Oxford) is open! Funkys Pizza & Daiquiri Bar is open! Funkys is open on Thanksgiving! 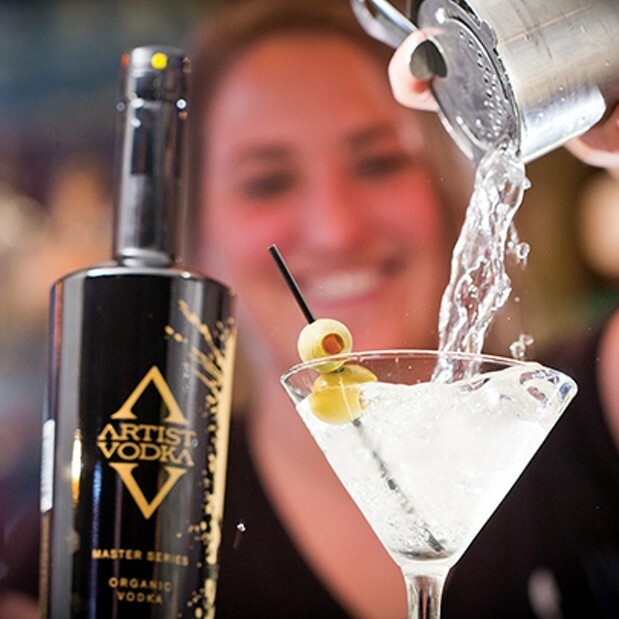 Drink specials change every Thursday… stop by for the latest special! The Levee is open on Thanksgiving! FREE THANKSGIVING MEAL today at The Library Sports Bar. Come hang out and watch some football! Moe’s Original BBQ is open! Moe’s is open on Thanksgiving! Old Venice Pizza Company is open! Old Venice is open on Thanksgiving! The Summit Lodge Bar is open! 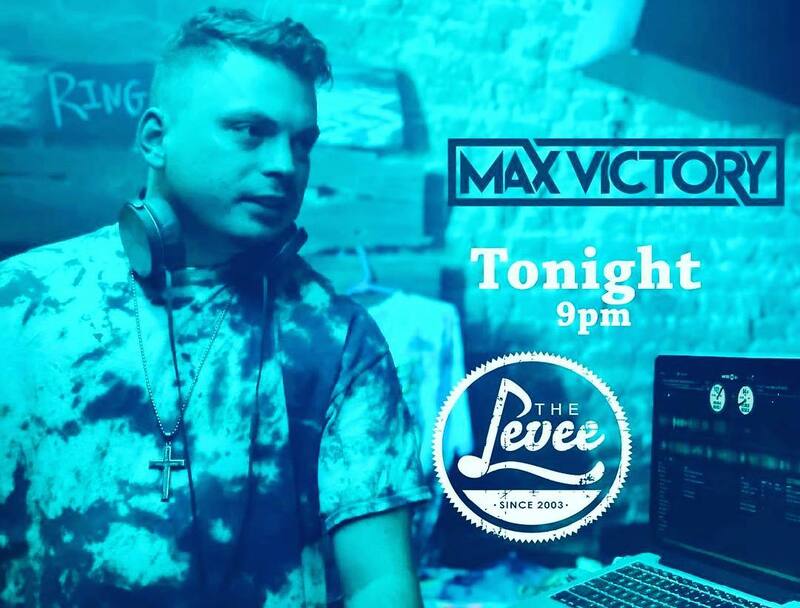 Levee: DJ MAX VICTORY – The Levee is open on Thanksgiving!